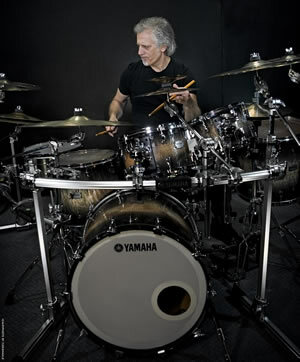 Dave has been a proud endorser of Yamaha drums since 1983. The combination of quality drums and hardware is simply unmatched in the industry. Dave's studio setup is a Yamaha PHX-Phoenix kit. It was developed and handcrafted after four years of extensive research at Yamaha's new drum laboratory. Working with world leading artists, sound engineers and drum technicians, the aim was to build the best possible sounding drum kit. Using Yamaha's 40 years of craftsmanship know-how, they completely redesigned and improved all the elements of the drum to create the ultimate in quality and in appearance. The shell of the drum is a hybrid of three materials; Jatoba, Kapur and Maple. In our studies into the vibration of a shell we understood the need to have different strengths of materials to enhance vibration. The centre-ply of the shell is made from Jatoba, this very hard material from Japan providing the core of the sound and is the strength of the shell. Either side of this is Kapur from Brazil. Kapur is a softer material than Jatoba which contributes to the body of the sound with warm mid-low range frequency. Finally, Maple from North America adds good response and balance. The shells are finished in either Maple or Ash, making the drums 11-Ply in total. The PHX also uses the YESS mounting system. It is mounted to a wooden plate using rubber parts attached to the shell, this system allows the shell to vibrate freely and keep the resonance and sound within the shell. The new Hook Lug is designed to take the majority of metal away from the shell to allow the drum to resonate. Using our deep understanding of the Nodal point, the new Hook Lug is mounted at a very special point of the shell to control unwanted shell vibration and overtones. Dave also has a long history of creating signature snare drums with Yamaha. They featured dual snare strainer designs with 8 lugs (14") and 6 lugs (13"), making them unique with amazing sound control. He recently subsitituted a 16" floor tom next to the hi-hat where a 13" snare drum was once used. An LP timbale is sometimes used to the right of the 14" floor tom. Though Dave's studio kit is a PHX, he often says that out on the road, he welcomes any Yamaha kit. Two other kits Dave plays on the road: Yamaha Live Custom and Yamaha Absolute Hrbrid Maple. 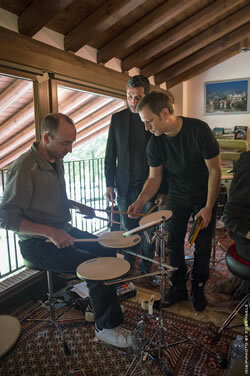 In 2013, Dave and Yamaha Drums celebrated a 30 year relationship. 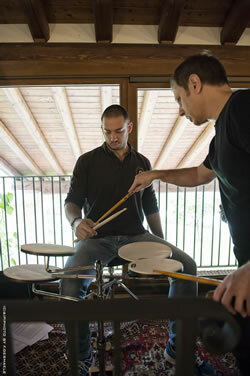 Dave travelled around the U.S. and Europe doing large group clinics and small group Intensives. 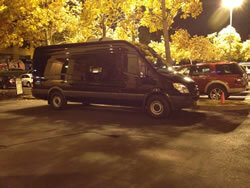 Here are some photos from the tour! 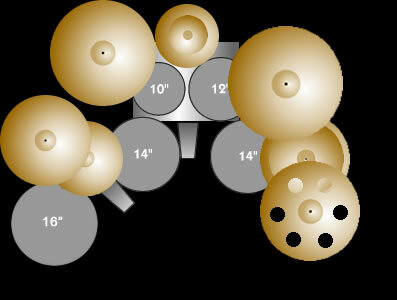 Click here to visit the Yamaha Drums Web site.